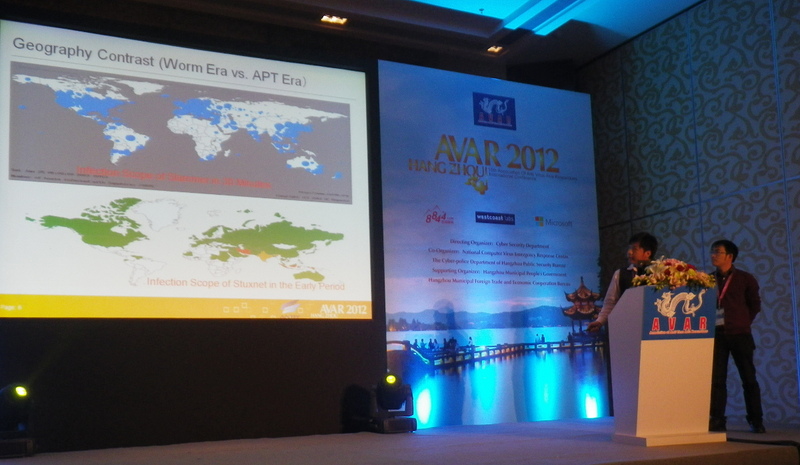 The AVAR 2012 Annual Conference (The 15th Asia Anti-Virus Security Conference) was held in West Lake, Hangzhou on November 13th and 14th in 2012. Several technical directors and technicians of Antiy Labs attended it. Tong Zhiming and Kang Xuebin, who come from the Anti-virus Engine R&D Center of Antiy Labs, made a sub-forum report that named Research on APT Detection Technology Based on Dynamic Analysis. They made an introduction to the industry friends about the work in view of APT threat detection and the experience obtained from it, summarizing the technical features and procedures of APT attack and introducing the past typical cases of APT attack. On the AVAR Membership Meeting that was held on 14th, after all members’ vote, Antiy Labs officially joined AVAR and becomes one of the enterprise members of the international anti-virus academic organization. AVAR, which is short for Association of Anti-Virus Asia Researchers, was found in 1998 and is a non-profit independent organization. It consists of global anti-virus experts and enterprises, dedicating to resist the spread and threat of malware and to play a significant role in global anti-virus industry. Antiy Labs has always been adhering to provide both high-quality public anti-virus services and various free detection and killing tools to global computer users and mobile intelligent end users, including the alarms, analysis, processes and follow-ups of significant malware events, the annual statistics and trend judgment about the situation of malware increase. Antiy Labs also actively participates in various open-source programs, joining international security organizations, attending large-scale academic conferences and industrial conferences as well as establishing good cooperative relationships with domestic and foreign universities and academic institutions. Joining AVAR not only confirms our past work but provides a better platform for us to participate in the global collaboration of antivirus practices.